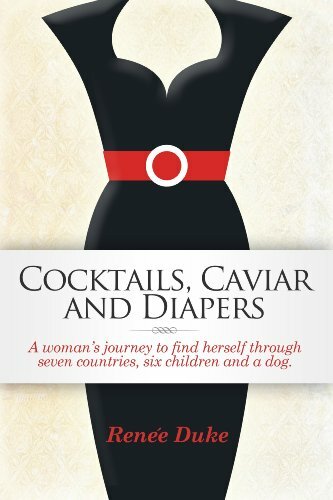 Ana Mardoll's Ramblings: Author Interview: Renee Duke on "Cocktails, Caviar and Diapers"
Author Interview: Renee Duke on "Cocktails, Caviar and Diapers"
Ana: Today we have Renee Duke introducing their book, Cocktails, Caviar and Diapers. I haven't read this book myself, but Renee was kind enough to agree to guest blog about their book to any readers who might be interested in the subject. Renee, how would you describe your book to your prospective readers? In broad terms, what is your book about? Renee: The book is a story of a woman's journey to find and free herself from a very difficult marriage back in the 1950s and 60s. It is set amidst the glamour of the rise of the jet-setting age. While it is fiction, it's a roman-a-clef -- a novel with a key. In other words, the names were changed to protect the innocent. It's autobiographical. The book was written by my mother, Renee Duke, prior to her passing away last year. I took on the job of editing it and publishing it. My mother was an amazing woman, who lived in many countries and raised six children. She was a fine artist, a poet, an author and, also was a newspaper reporter for the International Herald Tribune and Fairchild Publications. Renee: I think all people, but women especially, will really feel the pain the main character goes through in a very difficult relationship, and ultimately the release toward the end. While it's not a "feminist" book, especially, my mother did have to disentangle herself from the "chattel-like" mindset of her time and that was not only an act of courage, but it is also inspirational even today. Renee: We will never know all of her intentions in writing this book, but I know with certainty that Renee Duke loved to help others -- it was her driving passion in life. If this book can help someone, she would have felt very happy. Renee: I don't have a book to compare this to; but if you like Madmen, or that era in general, this book may give you some additional desirable color of that time. Renee: This is the only published book by Renee Duke. That's it. Renee: It's on Amazon, priced at $.99 and free for lending. Renee: Take a look at the sample and see if you like it!